If a Templar field psychologist hits a career high and no one’s there to see it, does she make a sound? Pan from panel two to three to four, zoom in, transition to five, transition to six, jump cut from seven to eight. 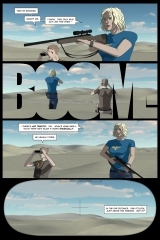 Naomi’s position and scaling work in a comic context as the outer edge of the scope is the exact same size as it is in the previous panels – the transition would probably work differently in video. There is a lot of work on this page. The short of it is there’s something like two months between panels five and six. Patreon supporters of various levels have gotten to see some of the work that’s been done in between – mostly test renders of updated airbase lighting, and the reference model of the creature in panels six and seven. It’s a goofy lookin’ thing, but it does its job – which is to remind the viewer that this is an Earth not the Earth. 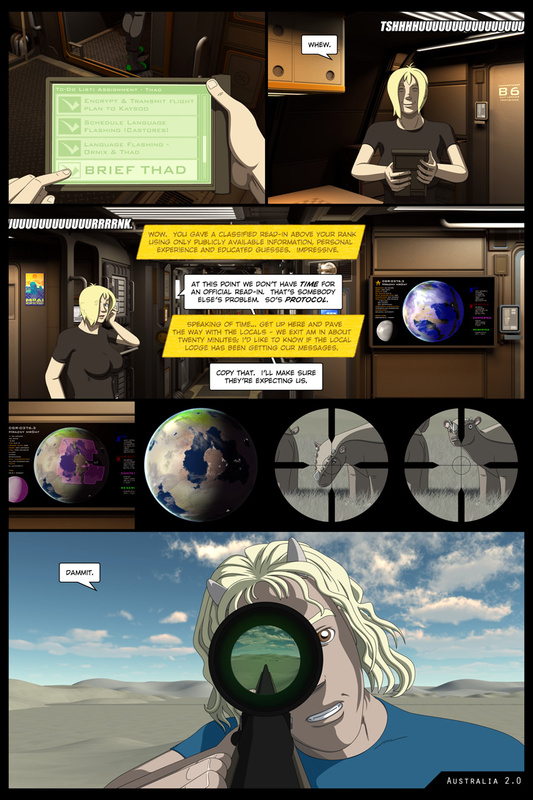 Real optics might not be as reflective as they are in panel eight, though they are reflective and that reflection is sourced from an actual scene reflection descended from a test render of a chrome shader on the scope. No shortcuts here, no sir. This scene was indirectly foreshadowed a ways back – though at the time Greymalkin was sowing seeds for what would have been book six of the series. The thing he’s referring to didn’t appear in The Dualist until the second edition, so if you don’t remember it being there, well… maybe it wasn’t. I’d say you should read it again but you might want to hold off on that – the list of edits I intend to do after I’m done with this installment is lengthy, though it doesn’t involve new pages, new panels, or major structural changes to the plot. I think all of that is safely out of the way! I posted all five pages of this scene to the ATC Patreon page earlier this week, then immediately started on 3d asset adjustments for the next scene. That blossomed into an extensive edit of all appearances of the shuttlepod. I did some additional work on the asset yesterday, and it’s now ready for closeups – something that wasn’t an issue in Air. It’s about to be an issue, and a big one – as of today there are 11 pages and 55 panels left of this installment of the comic. Scene setup and rendering starts this weekend. I’d like to get the scene rendered this month – what happens after that is anybody’s guess. I’ll go into more details in future page metadata – there’s enough pages in this scene to post one every week in August and that is the plan. Folks, we are entering the home stretch. 112 queries in 0.988 seconds.